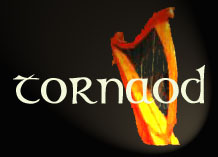 Tornaod is a band from the celtic area in France, Brittany. They began in 1998; their name means "cliff" in the Breton language. 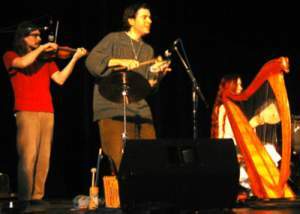 They call their music "inter-celtic" - part Breton, Irish and Scottish. 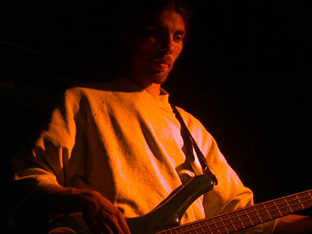 They play traditional music, with an influence from rock, new age and folk-rock. 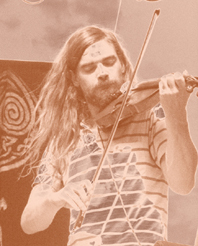 The music sounds a little like celtic music from Spain, and has rich, interwoven strands of instrumentation and voice. Their members are Tomaz Boucherifi-Kadiou (called TBK), who writes the compositions, lead vocals, guitar, bombarde, tinwhistle, and banjo; Cecile Korbel, harp; Stephen Clark Swartz, percussion (bongos, talking drum, dong-dong, washboard, darbouka and autres; John Lang, bodhran, uilleann pipe, low whistle, coeurs and cuillers; Philippe Escrivant, fiddle and electric violin; Stephane Siala-Cugnot, guitar; Michel Pengam, electric and acoustic guitar, banjo; and Tristan Sibille, drums. These photos were taken by Rodolphe Laurencin and are used on this webpage with the kind permission of Tornaod. 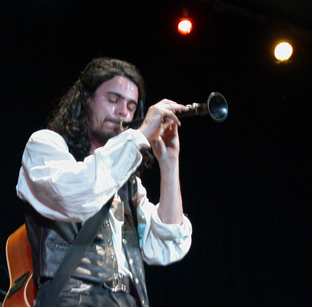 I had planned to add my own photos of them, after I saw them at the Celtic Fling in Pennsylvania in June 2003, but illness prevented my going. Hopefully they will return to the U.S. soon!